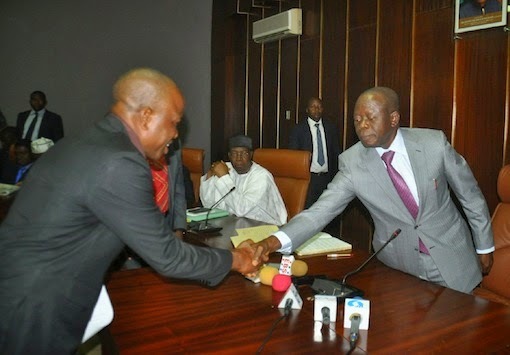 It was a case of hiring and firing on Tuesday in Benin, as Governor Adams Oshiomhole of Edo state, suspended Mr. Alhassan Mohammed for two months few minutes after swearing him in as Chairman, Etsako West Local Government Area of the state. Mohammed was sworn-in as the new chairman, following the death of the former chairman of the Local Government, Alhaji Hassan Kadiri, last Friday. The Governor thereafter directed the new vice chairman of the Local Government, Mr. Busari Yusuf, to act as the interim chairman pending the findings of a panel of enquiry to investigate the allegations against the new chairman. Speaking Tuesday at the swearing-in ceremony, the Governor said: “I have just performed the task of swearing in the vice chairman of Etsako West Local Government as the substantive chairman of the local government following the death of the chairman, Alhaji Hassan Kadiri who passed away last week Friday. “This afternoon I have performed a task with mixed feelings. On the one hand, I had the privilege of having to swear in a Chairman and on the other hand I am pained by the loss of someone who worked so hard for this party and who believed so much in his community but what made me even more sad is the fact that there were controversies as to what happened the very day that Hassan passed away. Oshiomhole continued, “I was informed that the purpose of this protest was that Hassan on his sick bed should be relieved of his duties as chairman so that the vice chairman could take over his job. I do not think human beings should play God. Today, I am hale and hearty and I thank God for being here to be able to sign what I have to sign, this is not by my strength, it is only by the grace of God. But what will become of me in the next hour I cannot say, I can only pray that I remain strong and healthy and I guess my story is the story of every human being. The Governor noted that, “Therefore in exercise of the powers vested on me as the governor of Edo State under the Local Government Amended Acts, where there are weighty allegations against Local Government Officers, I have powers to carry out a thorough investigation on those allegations because we know for a fact that to allege does not necessarily mean to prove. Allegations must be proven before further actions can be taken. “I do not have all the facts as to whom and who are responsible for these protests but I know there was a protest that could have easily destabilized the entire local government with serious implications for community relations. However who is behind it, though we know the characters that were on the street, at least some of them, we do not know the characters behind those who were on the street. As our people say, for every bat that is dancing on the road, there is someone beating the drum in the bush nearby. It is the drummers that we now must go for. “The name of the former vice chairman who is now the chairman has been mentioned by different persons as being responsible for financing and instigating students who are supposed to be on vacation and who are on vacation to come back and carry out those protests in order to force the resignation or the removal of the chairman that was bedridden. “As a matter of conscience, therefore, I have decided that these allegations have to be investigated and under the Local Government Amendment Acts, while these investigations are going on, the chairman has to be suspended. I have served him his suspension letter, he stands suspended with immediate effect and I will be announcing a Commission of Enquiry that we investigate all the issues that led to that protest. Until then, depending on the findings of the Committee, the Vice Chairman that has just been sworn in will act as the Chairman of Etsako West Local Government Area in accordance with the Local Government Amended Act”. “This government will not submit to political sentiments. We must respect people even on their sick bed and anyone who seeks to profit from the misfortune of others does not have my backing. So I want to appeal to all concerned to maintain the peace, we have an open mind, we will select men and women of integrity as members of the Administrative Panel and their report, when forwarded to me, will be submitted to the State House of Assembly which has the responsibility to go through it together with my recommendations and they will decide the way to have this matter finally settled. “I have acted in good faith and I believe that our people in Etsako West should not doubt my sincerity of purpose. I have a duty to maintain peace in every part of the state and this action is meant to show that this government will not reward those who wish ill for others. We should be our brother’s keepers,” Oshiomhole stressed.